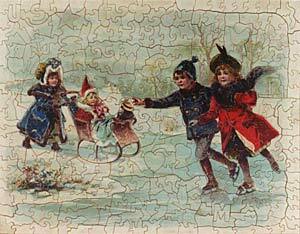 I love old hand-cut wooden jigsaw puzzles. As a young boy in the 1940's, I enjoyed assembling wood jigsaw puzzles in the family, and now in my retirement, I spend most of my time buying, restoring, exhibiting and selling puzzles. If you wish to buy, sell or just learn about old (antique) puzzles, you are invited to explore my web site and contact me at: . 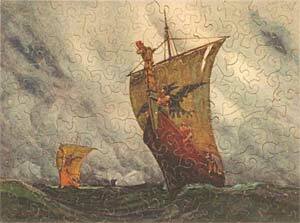 Examples from the Collection: Pictures and descriptions of over 800 puzzles, organized by categories and themes. Happy puzzling, and thanks for visiting my site. P.S. The puzzles on this page are small samples from my collection. Click on their images for a larger image and a description of them. Our 2018 Fall Sale has begun on October 26 and will end 10 pm, EST, November 4, 2018. You can participate through this website page and using email or telephone to place bids.